­­­­Throughout Brazil, millions of people danced in the streets Sunday night. They were celebrating the election of their new president, Jair Bolsonaro. He is a conservative who has managed to break the hold the socialist (essentially communist) “Workers Party” (PT) has had on Brazil for the past 15 years. My family is among this ecstatic throng. My wife is Brazilian, and my in-laws are middle-class property developers in northeastern Brazil. Their life has been difficult in recent years, as corruption, inflation and a wave of obstacles and restrictions have ravaged the once-vibrant Brazilian economy of the early 2000’s. Other liberal media outlets pretty much followed suit and seemed incapable of writing a headline without labels such as “Right Wing” “End of Democracy” “Racist” and other such condemnations. After tonight’s final election results, the noise from the critics will only increase. However, in Brazil things are drastically different. Partly due to the reality of their lives and because they did not enjoy the luxury of mouthing socialist platitudes or living richer than the bourgeoise, as many of their European and American critics do, they see things differently. Under the weight of their very real problems, millions of Brazilians have kept their fingers crossed and prayed mightily for God to change things. Tonight, they erupted in joy. But more than that, Brazilians are celebrating a nation finding itself again. In order to understand the scope of the change, it is necessary to take a few steps back. For over 15 years, Brazil has been led by the Workers Party, called PT in Brazil. PT is led by former communists and friends of the Castro’s and Hugo Chavez. They started Brazil on a journey much like the one Venezuela travelled. They were just further behind the curve. The leader of the PT party, Lula da Silva, was president for eight years. He now sits in prison for corruption. His chosen successor, Dilma Rousseff, who in her youth was an AK47-carrying anarchist with multiple jail terms (Lula had them too), was impeached in 2016. With all the turmoil over PT corruption and misuse of Brazil’s newfound oil wealth, not to mention the national embarrassment over the Olympics and World Cup scandals, the economy and the growing entrepreneurial spirit in the nation faltered. Mass demonstrations became a common occurrence, especially as the burgeoning scope of the corruption was uncovered. But amidst the chaos, Brazilian institutions, particularly the Brazilian supreme court, were able to hang tough and insist that the rule of law be followed. The PT and many of their followers pressed hard. The justice system had to resist the pressure again and again, even as recently as this past summer. Increasingly, protests arose in an effort to get Lula released from prison so that he could run for another set of terms for president, or at least direct the PT efforts during the campaign. However, the judges of the nation held firm on the law. Lula still sits in his cell and will be there for many years. As impressive as the institutional courage is, in order to understand things, we need to take yet another step back. This all goes deeper than institutions alone. Something has happened with the people of Brazil. They have changed. And yes, as ironic as it sounds for this largely coastal population, it can truly be called a sea change. The tide has brought in something very different. And it has been coming on for a while now. In recent years, as crisis has consumed Brazil, there has been a notable shift in political, social, and religious attitudes. According to a 2016 survey, 54 percent of the Brazilian population held a high number of traditionally-conservative opinions, up from 49 percent in 2010. The shift is particularly evident on matters of law and order. That is an amazing statistic — 5% change in 2 years — especially when you consider that Brazil is a country of young people, not middle-aged and older like so much of the developed world. The same youthful idealism that drove a youthful leftward tilt worldwide helped drive Lula to the presidency and the PT to power in 2002. Western rock bands singing John Lennon’s Imagine and other revolutionary ballads brought also rocked huge Brazilian crowds. A sense of endless possibilities and limitless freedoms enveloped many of the young people. The youth a decade ago had turned markedly to the left. Add to that the fact that Brazil, with its fully-developed artisan class and large numbers of intellectuals and academics, celebrities, and other stars often parroted the latest ideological phrases from liberal society worldwide. The Brazilian media became much more like the left-tilting American media. They often drew their news feeds from US pundits, and unfortunately spent more time discussing the “scandal of the day” as presented in the United States than they did the deeper issues in Brazil. Almost without fanfare, great numbers of younger people in Brazil began turning away from the Left — particularly the hard-left PT party of Lula. This was dramatically illustrated earlier in October 2018 when the Pink Floyd founder Roger Waters, on tour in several Brazilian cities, injected into his concert a visual message “Against Fascism.” He posted a slide with overt criticism of Donald Trump, Bolsonaro and other populist leaders around the world. But then came a shock: Thousands in the crowds of Brazilian youth at various cities on his concert tour rejected this message when it appeared on the screen and began chants of “Fora—PT!” (“Out with the PT party!”). In some cases their spontaneous uproar lasted several minutes. What is going on? It seems that Brazil, as a nation, may be going through that process the American thinker Irving Kristol once described as “a liberal getting mugged by reality.” It has become much more conservative. Usually, when this happens, it happens to older segments of a population. But Brazil has had it especially tough and it is increasingly happening with the young. What are the implications for Brazil, and for the rest of the world? First of all, we have to note once more the rejection of globalism and, concurrently, of the prevalent cult of “political correctness.” The often brutal-sounding worlds Bolsonaro has used are not that much different from those Donald Trump has used in his well-known tweets and rally speeches. Many of us believe that they are designed as wrecking balls against politically correct jargon. But they not only fly in the face of the “correct” speech part of the required language. They also speak to a different underlying worldview than the world has seen in its political class for decades. It is a worldview not only with opposite values, but one ready to engage in ideological confrontation. On popular terms. The world’s elite is unaccustomed to such confrontations and — frankly — still does not know how to handle them. Thus many will continue to misread the Trumps and Bolsonaros of the world. This rightward shift has been accompanied by a massive growth in the country’s Evangelical Protestant and Pentecostal churches, which constitute the greater part of Brazilian Protestantism. The percentage of those who identified as evangelicals in Brazil has grown from 6.6 percent in 1980, to 22.2 percent in 2010. And one place where this new force has been felt is on the cultural front. As you probe deeper into the dissatisfaction with the status quo in Brazil, you find that some of the more aggressive ultra-left social agenda moves panned (or even lauded) in the United States and Europe have started firestorms in Brazil. One such was an “art” exhibit in Sao Paulo in 2017 where the artist was encouraging visitors to view and touch a living, naked man who was lying on his back before the audience. They were told to bring their children and when one brought a four-year-old girl and it hit social media, many in Brazil exploded in anger. Brazilians love and protect their children fiercely. What is called “the Religious Right” began a series of protests and campaigns centered around various exhibits that were similar. Pickets marched around art museums with signs. The Christian element of the country spoke out strongly, and even more significantly, prayed fervently for a change in course. Third, the economic conditions have no way to go but up. And they have been showing signs of resurgence ever since the stupefying first-round success of Bolsonaro. Immediately after the initial election in early October, the Brazilian stock market reacted immediately (and has held the high ground for the three weeks since then). The Brazilian Real rebounded as well. It had been trading at above a 1:4 rate (to the US dollar) for some months. For all of October it has been gaining strength and by election night had reached 1:3.5. Most analysts project a return to the more traditional 1:3 or even better within a short period. 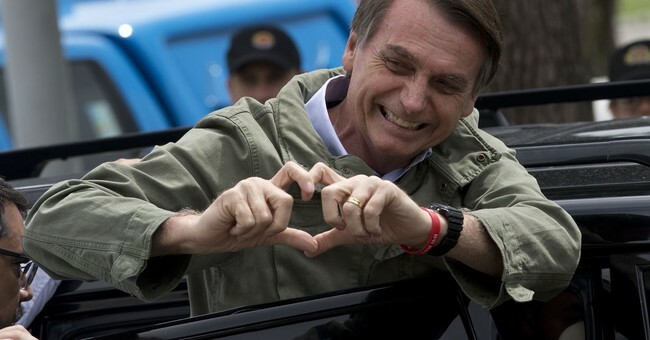 Far-right presidential candidate Jair Bolsonaro’s commanding first-round win all but assures his victory in the Oct. 28 runoff, said Guild, 76, who has been investing internationally for five decades. He expects the Brazilian real to gain at least 10 percent to 3.4 per dollar within the next few months as investors cheer the fiscal plan crafted by the likely finance minister, Paulo Guedes, who has a doctorate in economics from the University of Chicago. What does this all mean for the rest of the world? As we have said, for many on the Left, it is seen as a “Far Right” disaster. But for many others, tired of the socialist leanings and moral libertinism of the modern Left, it brings hope. For millions of Christians, particularly those who staunchly support the surging counterculture — based upon a Christian worldview — now growing in many nations, it offers an opportunity. It means than perhaps now is the time to turn their nations around and rebuild democratic ideals based around the Judeo-Christian worldview. Above all, it requires diligence in national efforts (by all countries) to keep our nations healthy as constitutional republics. We must be guided by law but also guarded from centralized power by elite groups, whether right- or left-oriented. It demands that we rediscover the source of the higher law that informs good law, good policy and good institutions anywhere on earth. For investors and businesspeople, it means that we must put our resources into Brazil and other countries, once they commit themselves to building their economies and their nations as places where individuals can prosper and be free to develop their dreams. For Americans who are dedicated to reinvigorating the weakened principles of our own republic, it means we have another large and significant country to our south that understands the urgency to do so — perhaps even better than we do. And immediately after that short speech, a Brazilian evangelical pastor who had accompanied them through the campaign led them in an impassioned prayer as the new president-elect, his wife and others joined hands with bowed heads. He prayed especially hard for the children of Brazil.